Rokinon announced 21mm f/1.4 and 50mm f/1.2 lenses for the Canon EF-M, Fujifilm X, m4/3, and Sony E mounts. 21mm f/1.4 data page. 50mm f/1.2 data page. I’ve updated the sansmirror site so that “next page” and “previous page” links are available virtually throughout, which should help with navigation on mobile devices. These links appear just under the article title. I’ll be doing that with the dslrbodies site shortly. Zeiss Names Another Lens Line. The ZF.2 manual focus lenses at Zeiss just got a full rethink. Now named Milvus, Zeiss has re-designed and re-introduced a six lens set for the Nikon F mount (and Canon EF-S). Article on dslrbodies.com. 21mm data page. 35mm data page. 50mm f/1.4 data page. 50mm f/2 macro data page. 85mm data page. 100mm data page. 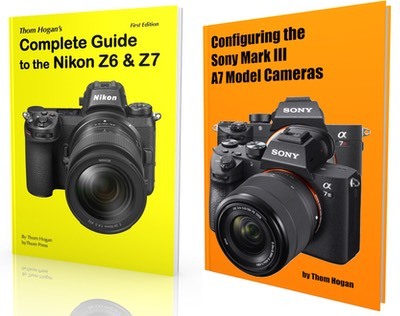 Sony Completes the Mark II Upgrades. Today Sony announced the final Mark II upgrade, the A7s Mark II. As with the other A7 models, the new camera gets a bit of body work to refine the hand position and controls, 5-axis image sensor stabilization, and improved autofocus. Article on sansmirror.com. A7s Mark II data page. Tamron Introduces Two f/1.8 Primes. Tamron has joined the prime parade with two new lenses, the 35mm f/1.8 and 45mm f/1.8. Both lenses cover the full FX frame, both lenses feature Tamron’s vibration control system (VC), and both are priced at US$600. Article on dslrbodies.com. 35mm f/1.8 data page. 45mm f/1.8 data page. Olympus Introduces, Suspends EM-10 Mark II. The expected second version of the EM-10 has shown up, with minimal specification changes to this small m4/3 camera. Article on sansmirror.com. Data page for EM-10 Mark II. New Panasonic 25mm f/1.7 lens. Panasonic announced a new 25mm f/1.7 lens to their lens lineup at IFA Berlin in August. Article on sansmirror.com. Data page for the 25mm f/1.7. Three More Nikkors You’ll Be Interested In. Nikon today introduced three new F-mount lenses, two of which are likely to be of some interest even to DX users. Article on dslrbodies.com. 24mm f/1.8G data page. 24-70mm f/2.8E data page. 200-500mm f/5.6E data page. Note: Since a number of people don’t fully understand E-type lens compatibility, I have added a section on it in my Making Sense of Nikon Lens Acronyms article and notes about compatibility in each of the database entries for E-type lenses. E-compatible is not a new thing. We’ve had such lenses for seven years now, but because the 16-80mm f/2.8-4E DX and 300mm f/4E lenses are targeted at a broader, more general, and often consumer audience, a lot of folk using older cameras missed the compatibility story when it first appeared. Short version: pro cameras since the D3 and consumer cameras after 2009 are fully compatible with E-type lenses, older cameras won’t let you set the aperture (aperture is stuck at maximum aperture). Update: I made a few small clarifications and corrections on the Acronyms page.